Enter promo code WFGTEECH at checkout to get your extra $4 off! Readout: Large size, 3.2 x 2.4 x 0.8 inches. The extra large numbers can be read clearly from anywhere in the kitchen. Alarm: Loud and clear buzzer can be heard from multiple rooms. Versatility: Can use magnets on rear to affix to metal surface such as a refrigerator or use Foldout Stand to use on kitchen-top. Portable and Compact: Lightweight and very easy to store. 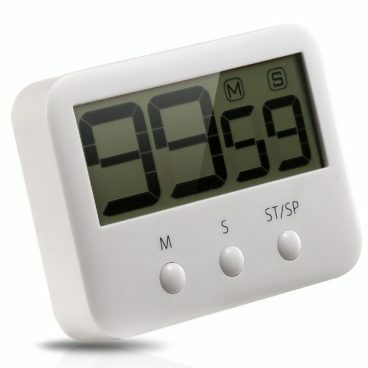 Ease of Use: Simple countdown function, can time up to 99 minutes and 59 seconds. Helps you enjoy the fun of cooking!